The Audi Lunar quattro is a lunar rover designed by PTScientists in conjunction with their technical partner Audi. 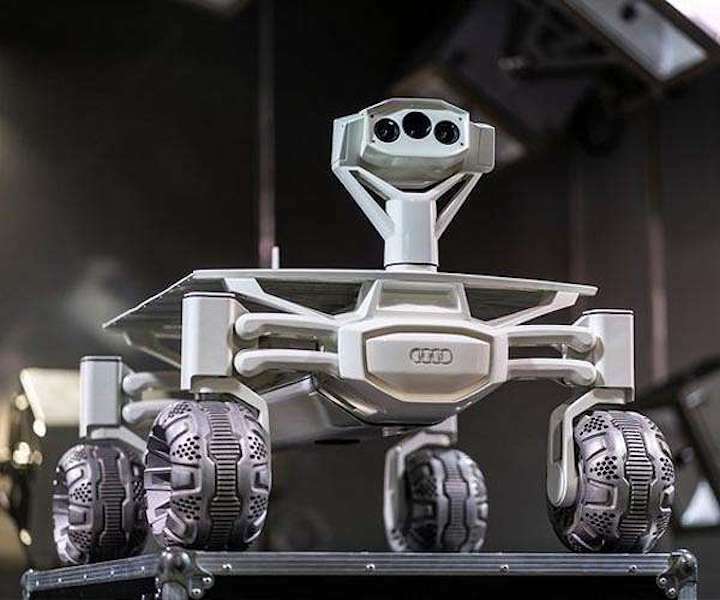 Featuring active suspension and four-wheel drive, the lightweight, sturdy vehicle has been designed to withstand the harsh environment of space and navigate the lunar surface. It has a mass of just 30 kg, with capacity to carry 5 kg of additional payload. The low mass has been achieved using state-of-the-art metal 3D printing techniques in partnership with the automobile manufacturer. Specialists from ESA's European Space Operations Centre in Darmstadt, Germany, are providing consultancy on flight dynamics and flight operations as well as preparing for driving two lunar rovers. In recent years, ESA has worked on the Multi-Purpose End-To-End Robotic Operation Network developing expertise in operating robots and in working with the specialised networks needed to remotely operate a vehicle on a moon or planetary surface from space. "We are supporting PTScientists in defining their mission operations concepts. All of the elements of which are important," says ESA project lead Kim Nergaard, from ESOC's Solar System and Exploration Missions Division. "To be successful, their team needs to prepare for the end-to-end operations of the lander from launch to landing on the Moon and handle all aspects of near-real time surface operations, as well as fitting that into a bigger mission control environment." "Right now, we are in the early stages, mapping out what their needs will be. As it becomes clear what will be needed to achieve mission success, we aim to support them with a suite of tools to achieve that." As well as drawing on a wealth of experience, the cooperation builds nicely into ESA's long-term plans for lunar operations. "We're happy to work with PTScientists during the definition of mission operations, and perhaps more in the future," says Andrea Accomazzo, Head of the Solar System and Exploration Missions Division at ESA. "While we help them to develop expertise, there is also a benefit to ESA in consolidating aspects of our operations concepts, so it should really be worthwhile for both sides." The first mission is planned to demonstrate technology, including a mobile-phone-style 4G communications network on the Moon, as well as revisiting - at a safe distance - the last Apollo landing site. ESA's Estrack ground station network will help make sure that mission controllers on ground can communicate with PTScientist's ALINA spacecraft, as they have done for recent Chinese missions to the Moon. "We are delighted with the support we are receiving from ESA's highly skilled experts. Together, we will perform the first privately funded European lunar landing. For PTScientists, this is the first stage of what we expect to be a long-term collaboration with ESA," says Robert Boehme, CEO and founder of PTScientists. Enabling European industry to make use of ESA's expertise and infrastructure is a key aspect of the Agency's support for the emerging 'ecosystem' of commercial space startups.